This nearly garnet Rose, like all our non-vintage sparkling wines, is aged 24 months en tirage. 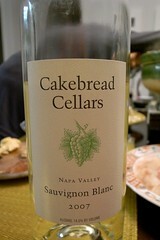 It has a lovely, bright floral bouquet with hints of strawberry, raspberry, and cherry. 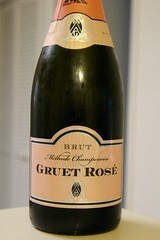 On the palate, it is rich and fruity in a dry, Brut style. The flavor of berries continues on the palate, revealing more strawberry, raspberry, cherry. 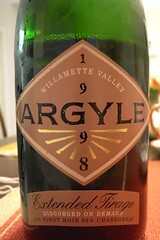 This sparkler is lots of fun and very festive, but production is limited to 5000 cases per year, so don't miss out! We night-harvest our Sauvignon Blanc grapes at cool temperatures to preserve their fresh, vibrant flavors and achieve an ideal balance of sugar and acidity. After the grapes arrive at the winery, we immediately press the whole clusters to maximize varietal character while minimizing the extraction of astringent compounds from the skins. In 2007, 59% of the juice was tank-fermented and aged in neutral French oak barrels; 26% was fermented and aged in barrel; and 15% was tank-fermented with no oak aging. This regimen allowed us to optimize the wine’s varietal intensity while enriching its texture through short-term exposure to oak. Take the richness of our 1996 E.T., and the yeasty bottle bouquet of our 1997 E.T., and you get a darn close approximation of this 1998 E.T. The color is a youthful, bright straw yellow. The aroma is fresh and continuously evolving. Look for tree fruits of ripe apple, pear, and white peach with elegant honeysuckle blossom and vanilla spice. The palate is a transcendent, full throttle mouthful of fruit, spice, honeysuckle, with fresh toasted biscuit yeasty goodness. There is a racy mid-palate juiciness on a mineral backbone. Seamless, rich Brut style! 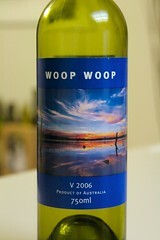 The wine is 100% Verdelho from the Limestone Coast region, located in the southeastern area of South Australia. With some of the youngest soils in Australia, the Limestone Coast formed as little as 750,000 years ago and consists of an underlying limestone base which, when coupled with the relatively cool climate makes for ideal grapegrowing conditions. Without using any oak, winemaker Ben Riggs has made a fresh, fragrant wine in a rich, fruit driven style, which finishes with a crisp and flavoursome persistence. Pale straw. Pungent scents of tangy citrus fruits and minerals. Firm and wound-up on entry, then quickly fills out to show crisp citrus and salty mineral flavors of impressive cut and energy. The finish offers notes of blood orange and honeysuckle. Very good value. 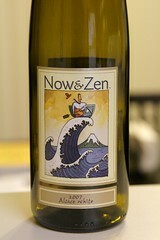 Our Now & Zen Alsace white is what is termed in Alsace as an Edelzwicker or noble blend of grapes. Adam Richardson, the Underdog Wine Merchants International Winemaker, spent time in Alsace collaborating with the local winemaker Benoit Pattin to develop this wonderful wine. 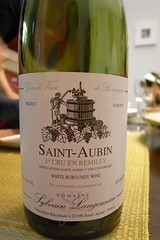 Our '07 Alsace White boasts a pale yellow color with slight green hue. 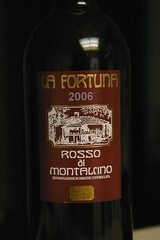 Its nose is aromatic, starting with floral notes, and then switching to fresh fruity aromas, both refreshing and complex.